Omega’s Conveyor Reject Inspection assembly consists of upside-down bottle detection, down bottle detection, and a bottle reject system. The down bottle sensor is positioned alongside the client's discharge conveyor. This photoelectric sensor is activated when a bottle’s leading edge passes the gate sensor. If the bottle is properly oriented, the sensor will receive a strong response signal (due to the beam bouncing off the bottle). If the bottle has fallen over, there will be no signal response. The system will reject any upside-down bottle. An air jet beside the gate sensor will blow the reject bottle into a bin. The upside-down bottle sensor is positioned above the client's conveyor. 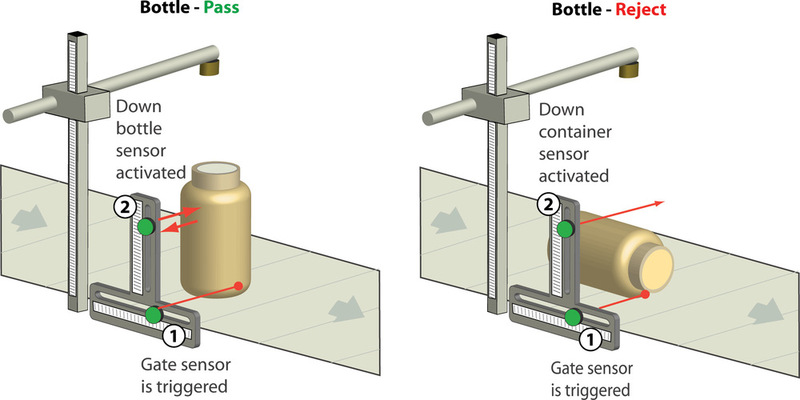 This photoelectric sensor is activated when a bottle’s leading edge passes the gate sensor. If the bottle is properly oriented, the overhead sensor will receive a relatively weak response signal (due to the beam having entered through the bottle’s opening). If the bottle is upside-down, there will be a strong response, which indicates the signal bounced off the base of the bottle.